It’s hard to know how smart animals are for the simple reason that they’re not able to come right out and tell us. Scientists have developed various methods over the years to assess animal intelligence, but a simple new body-awareness test involving elephants may be a promising new tool to add to the arsenal. A new study published in Scientific Reports shows that elephants know when their lumbering bodies are an obstacle to achieving a goal. In an experiment led by Josh Plotnik from the University of Cambridge, elephants passed a body-awareness test, showing that they are capable of recognizing themselves as being separate from their environment. This new test contributes to our understanding of elephant intelligence, but it also shows that we need to make intelligence tests that aren’t biased towards human capacities. Determining an animal’s capacity for self-awareness—that is, the capacity for introspection, and the ability to recognize oneself as being separate from other individuals or objects—is not easy. The classic way to do this is the mirror self-recognition test (MSR), which requires animals to recognize the reflection in a mirror as being their own. Sounds relatively straightforward, but that’s because we’re humans. This task is absurdly easy for members of our species older than 18 months of age. Of all the animals that dwell on this planet, only a precious few can pass the mirror test, including great apes, dolphins, magpies, and elephants. Recognizing the capacity for self-awareness in an animal is important because it’s indicative of other cognitive and social skills, such as cooperative problem solving, perspective taking, and empathy. 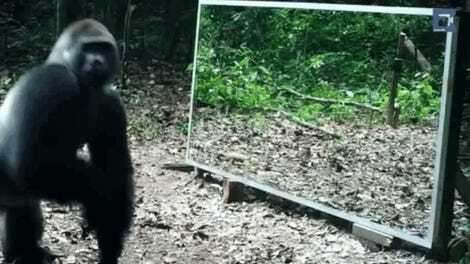 A recent experiment showed that monkeys can pass the mirror test too, but they had to be trained to understand how reflections work. For monkeys, this isn’t a natural ability, and it’s not totally clear from this experiment that monkeys are truly grasping the concept. But that doesn’t mean monkeys aren’t self-aware, or intelligent in other meaningful ways. A problem with the mirror test is that it’s biased towards certain animals, particularly those that are more visually oriented. And there’s more to intelligence and self-awareness than simply looking into a mirror. 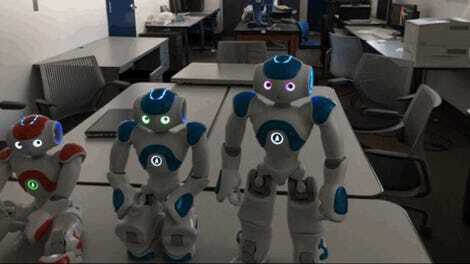 That’s where the new body-awareness test comes in. This test isn’t meant to replace the MSR, but it is designed to provide researchers with an alternative way to test for awareness in animals. It’s adopted from a test in which children are asked to push a shopping cart, but the cart is attached to a mat on top of which the children are standing. In humans, the ability to make a connection between self and the environment comes after the age of 18 months. Plotnik, along with his colleague Rachel Dale, wanted to see how elephants would respond to a similar test. For the test, the researchers attached a stick to a rubber mat with a rope. Elephants were required to walk on top of the mat, pick up the stick and pass it to a person standing in front of them. 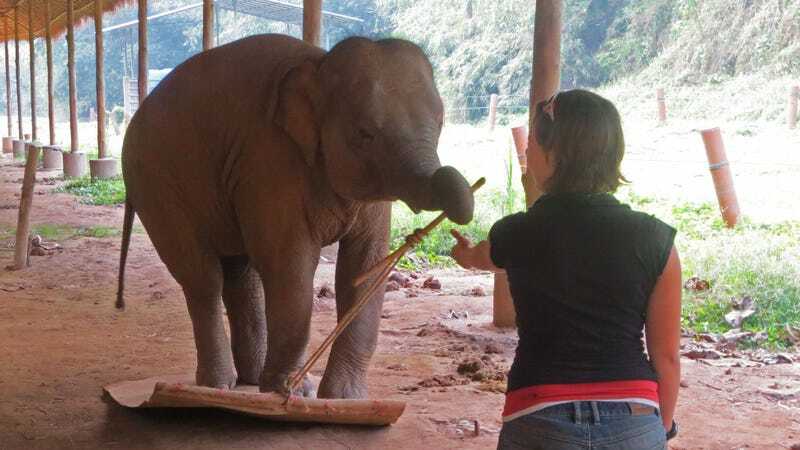 But as the elephant quickly discovers, the stick can’t be lifted all the way because it’s standing on top of the mat. In order to be able to hand the stick over, the elephant must step off the mat and try again. Perhaps unsurprisingly, elephants excelled at this task. In tests involving 12 elephants, the animals successfully completed the task nearly 90 percent of the time. This suggests that elephants are capable of recognizing themselves as being separate from objects or their environment, and they appear to have a level of self-understanding—intertwined with their ability to pass the mirror test—that’s quite rare among animals. The sample size is small but the authors found their results statistically significant nonetheless. That said, this study appears to be the first to employ a body-awareness test on animals, so further research will be needed to corroborate these findings. Clearly, there is a need for greater variability in the ways in which psychologists assess non-human animals’ understanding of self. Specifically, greater attention is needed to the development of more novel, comparative and ecologically valid approaches that take the evolutionary strengths—size and sensory in particular—of individual species into account. In other words, we have to stop making tests that are biased towards human capacities, and create new tests that allow animals to let us know just how smart they really are. We reached out to the study’s authors for comment and we’ll update this post should we hear back.